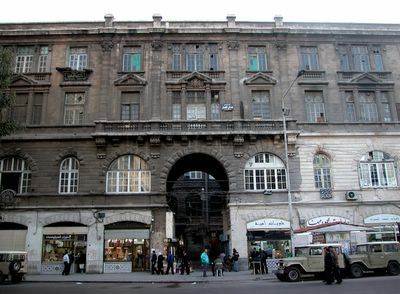 Al-Abed Building is one of the finest examples of early 20th century architecture in Damascus. It was constructed in 1910 by the Spanish architect Fernando de Aranda (1878-1969), who is thought to be the same architect who designed the Hijaz Railway Station. For decades, the building has been victim to the dirtiness and pollution of downtown Damascus. Now it seems to be undergoing a long-waited cleaning action. That's interesting ... it looks like it could fit in well in Florence, Italy. Another evidence of the architecture quality of the Ottoman Syria. nice blog full of great pictures! Finally! Is this a byproduct of the Sanitary laws that President Assad enacted at the beginning of the year?